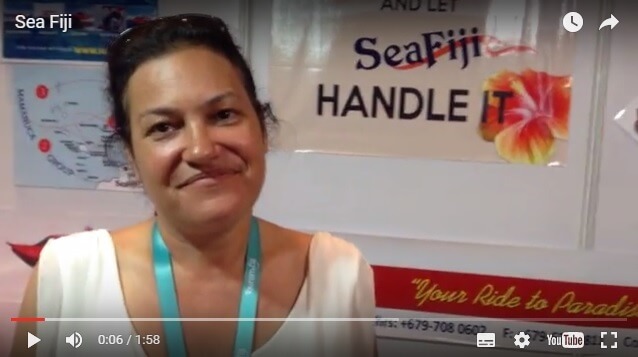 Exhibiting at the Fiji Wedding Expo 2016, Dean White said “If you book with us, just keep calm and let SeaFiji handle it. This is how Dean White and his dedicated, vibrant team at SeaFiji have been doing business for the past 16 years in ensuring that tourists and visitors to Fiji always have a reason to return and experience the real Fijian hospitality. Dean, originally from New Zealand, has been in the Fijian tourism business when he arrived in 1995 and since then, he has known too well the techniques and ways of managing everyday dealings he comes across. “We provide 24- hour transfers and activities on the water that the guest may want and this includes trips to Cloud 9, diving, fishing, jet ski safaris and we work with the resorts and the in-bound operators and even wedding and event planners so when a family or a group comes over, they book everything before they come,” Dean said. “This includes their transfer down to the mariner, we have a safety video that we have made and we do that in the lounge and right from the time they arrive, we carry their bag ensuring they are safe and they enjoy their travels. Dean said the whole concept was to make their Fiji holidays easy and simple as it should be. For the past 16 years, Dean said business had been good and while he enjoyed every little thing he did he offered more of a personalised service to people with the idea of having people coming back year after year. He said this had happened and people’s love for their service had kept them coming back to Fiji. “If you visit Fiji, you need to visit the islands and it’s a shame if you don’t because that is where the real Fiji experience is,” Dean added. While he is a person who loves to be on the water most of the time, Dean said he looked forward to offering more services to tourists who wished to spend their holidays in Fiji and made it a memorable one.